Loop is installed as two projections shown in sync, back to back on each side of a single screen, suspended in the middle of the gallery. 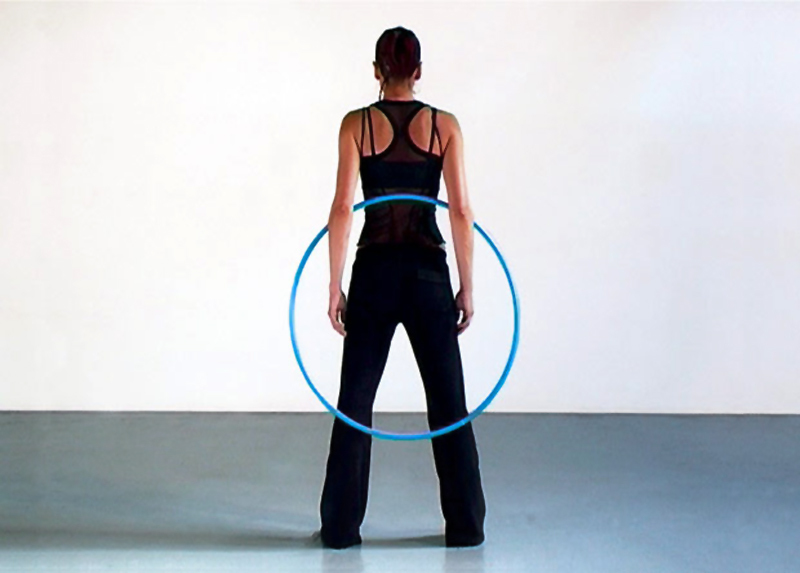 The two films show a female figure spinning a hula-hoop around her waist. On one side of the screen the viewer sees the girl head on, while on the other side the viewer sees footage of the girl filmed from behind. Both videos are made up of a 2 second seamless loop created to give the impression that the girl is rotating the hoop forever. "The Loop (2004) consists of two images, one on the front of the screen, the other on its dorso. 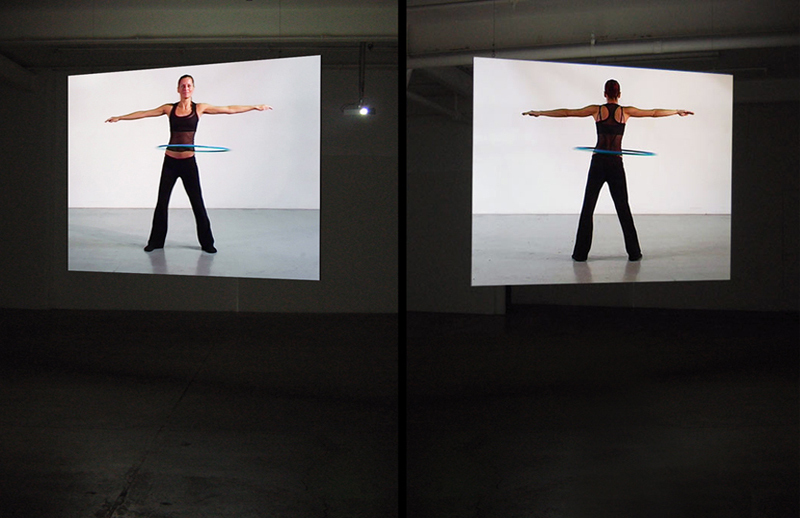 They are synchronised views of a woman spinning a hula hoop with her body, arms stretched horizontally. The intriguing differences between the expected and the delivered, between two flat images and added walk that joins them, define the art as a convincing lie, a term I borrowed from Pablo Picasso. His Acrobat on a Ball (1905) is a reminder of the Modernists interest in the subject, his print Acrobat (1930) after all inspired the beautiful blue female Acrobats (1952) by H Matisse. Doherty’s video shares with them the silence, the concentration, the calm confidence as significant qualities. The sting and the twist come from the medium – the loop may run as long as the equipment lasts – and no longer." "Repetition and the joys and pains of forgetting come to mind, the fact that we circle around our desires and symptoms with equal pleasure. We rub it until it bleeds. In this respect the art object becomes a locus of contradictory urges, and the viewer circles the object like a patient trying to figure out why life hurts so much. 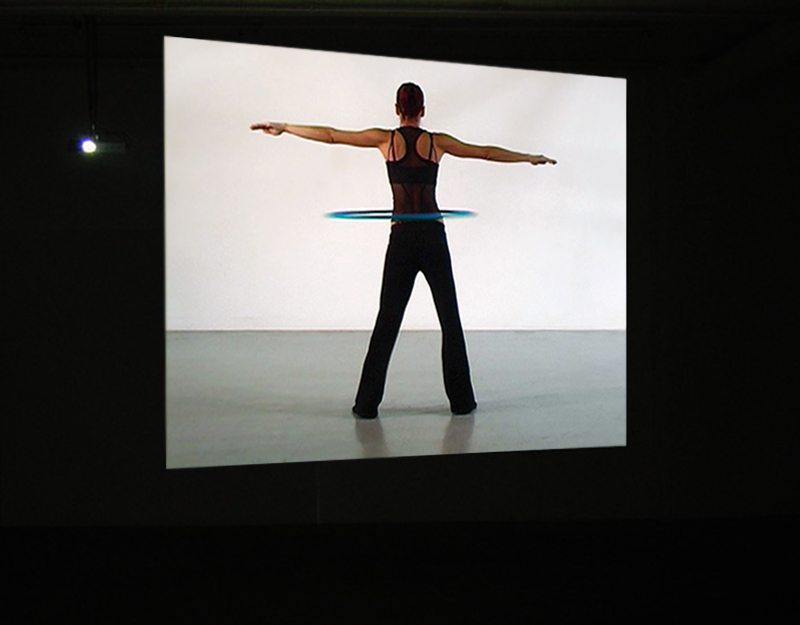 This was made explicit in his film installation ‘Loop’, 2004, in which a female figure spins a hoola-hoop around her midriff. We are presented with front and back shots of the scenario, and the viewer is invited to walk around both screens, mirroring the on-screen action. The film too is looped and could, in the theory, continue to spin until something breaks." - 'Maurice Doherty - The Art Of Memory' - Alexander Kennedy - The List Magazine, Scotland. "In Loop the audience is not gratified with conclusion or climax, Doherty has looped the footage of a woman spinning a hula-loop around her waist, it's frustratingly infinite both in concept and representation. Doherty's works seduce you with their humorous suspense allowing you to work your way to the elemental themes that lie beneath the surface."